• iPod®, iPad®, and iPhone® are registered trademarks of Apple Inc. Sold separately. 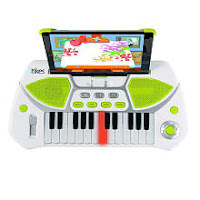 Read Coupon Gator Mommy's review on the iTikes Piano. One lucky winner will receive an iTikes Piano. This giveaway ends Nov. 21, 2012 at 11:59pm EST. My daughter, she would have a blast with this! I WOULD LOVE TO WIN THIS FOR MY SON!!!!! I would love to win this for my nephew! His family loves music and I think this would be a gift right up their alley. Thanks!